Mount Emei, or “Delicate Eyebrow Mountain”, is so-named because its two major peaks face one another and supposedly resemble the lofty brows of a classical Chinese beauty. The name itself may raise a few eyebrows, but Mount Emei’s unparalleled natural beauty is sure to win the admiration of even the most sceptical tourist! It is classed as one of the Four Sacred Mountains of Chinese Buddhism and its cultural significance, coupled with its spectacular scenery, meant it was designated a UNESCO World Heritage Site in 1996, along with the nearby Leshan Giant Buddha. Reaching a staggering elevation of 3,099 metres (10,167 ft.) at its peak, it is the tallest of the Four Sacred Mountains. Archaeological evidence indicates that the slopes of Mount Emei may have been settled as early as 10,000 years ago, although the first temple wasn’t built there until the 1st century AD. 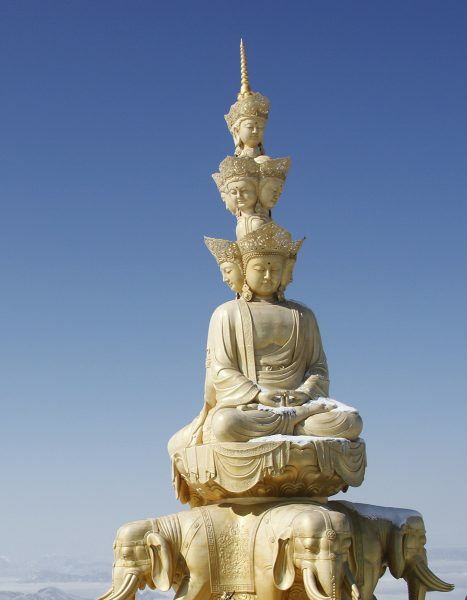 Originally it was a Taoist retreat, but sometime around the 3rd century it became known as a sacred Buddhist mountain and was the first place in China where a Buddhist temple was built. It is traditionally believed to be the bodhimaṇḍa, or place of enlightenment, of the bodhisattva Samantabhadra, known in Chinese as “Puxian”. For over 2,000 years, this misty mountain has been regarded as a special and intensely holy place. As time went on, numerous temples and other religious buildings were erected across the mountain’s vast expanse. Nowadays it boasts over 30 temples, ten of which are of particular historical note. However, it seems Mount Emei might be directly facing some serious competition! On a hillside opposite the mountain, the Leshan Giant Buddha looms over the confluence the Minjiang, Dadu, and Qingyi rivers. At a colossal 71 metres (233 ft.) in height, it is the tallest pre-modern statue in the world and is nearly twice the size of Christ the Redeemer in Brazil! This Buddha may be big, but it’s not quite big enough to completely overshadow its mountainous neighbour. Blanketed in a diverse range of vegetation, from subtropical to subalpine forests, Mount Emei is undoubtedly a feast for the eyes. Some of its trees are over 1,000 years old, matched in age only by its ancient temples. These temples blend seamlessly into their natural surroundings, demonstrating the perfect marriage between man and nature. The most famous of these are Baoguo Temple, Wannian Temple, Qingyin Pavilion, and the Golden Summit. Baoguo Temple was built during the 16th century, and is widely regarded as the centre of Buddhist activities on the mountain. It is perhaps most famous for the engraved stone slab that hangs above its gate, on which its name was written by the Kangxi Emperor of the Qing Dynasty (1644-1912). However, other major highlights of the temple include its serene gardens, library of sutras, and decorative porcelain statue of Buddha. Unfortunately this statue somewhat pales in comparison to the 7.85 metre-high (26 ft.) bronze statue of Samantabhadra riding an elephant that can be found in Wannian Temple, which weighs a stunning 62 tons. In a bizarre twist of fate, it actually weighs over 8 times as much as an actual African elephant! It was commissioned on imperial order during the Song Dynasty (960-1279), although the temple itself was founded sometime during the 4th century. To this day, no one knows exactly how such a hefty statue was transported up the mountain. Located in the middle section of the mountain, Qingyin Pavilion is a complex of pavilions, towers, and platforms that date from the 6th century onwards. It is crisscrossed by the rushing Black Dragon River and White Dragon River, so-named because their waters are dark green and ivory white respectively. The complex’s architecture is particularly breath-taking, but tragically not enough to make Qingyin Pavilion the mountain’s star attraction. That accolade is solely reserved for the Golden Summit. The Golden Summit rests at an elevation of 3,077 metres (10,095 ft.) and its name is derived from the small bronze temple at its peak. As if that wasn’t impressive enough, there is also a 48-metre (157 ft.) tall bronze statue of Samantabhadra near the temple, which weighs over 600 tons! 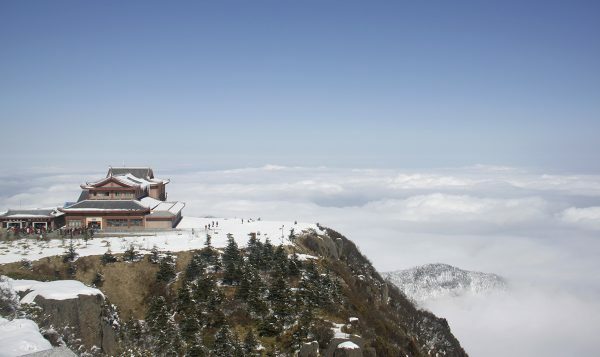 While this may not be the mountain’s actual summit, it’s the ideal place to soak in the scenery and experience the Four Great Spectacles of Mount Emei: the sunrise, the sea of clouds, the rays of Buddha, and the sacred lamps. While the sunrise and the sea of clouds are reasonably self-explanatory, the last two natural phenomena are unique features of Mount Emei. The rays of Buddha occur about 14 times every year and can only be seen when the area is thick with clouds. If you look out into the clouds at the right moment, the refracting light will make it appear as though your shadow is surrounded by a circle of colourful light, much like a rainbow. Similarly, on some dark nights at the summit after it has been raining, you might see flashing lights in the mountain valleys, providing there is no moon in the sky. These fabulous illuminations have been nicknamed the sacred lamps. However, even without these flashing lights, a trip to Mount Emei is sure to dazzle you!